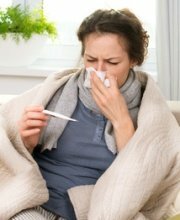 Most people know that household mold can be bad for your health, and it makes an unsightly and bad-smelling mess, but did you know it can cause serious damage to the home, as well? It can. Dealing promptly with a household mold problem not only prevents the problem from getting worse, and therefore more expensive to deal with, but it can literally save your home. 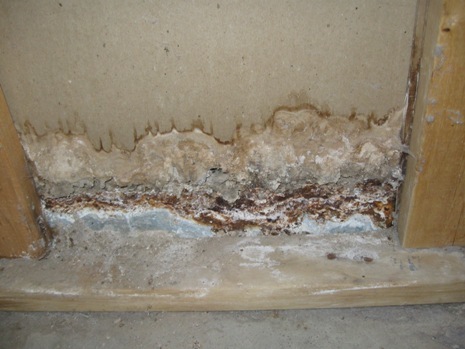 Mold feeds on organic materials, such as wood, paper, many fabrics, and even some types of glue. 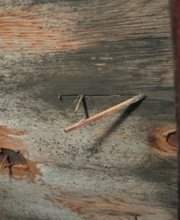 It literally eats away at these materials, causing them to rot and fall apart (see picture to right). 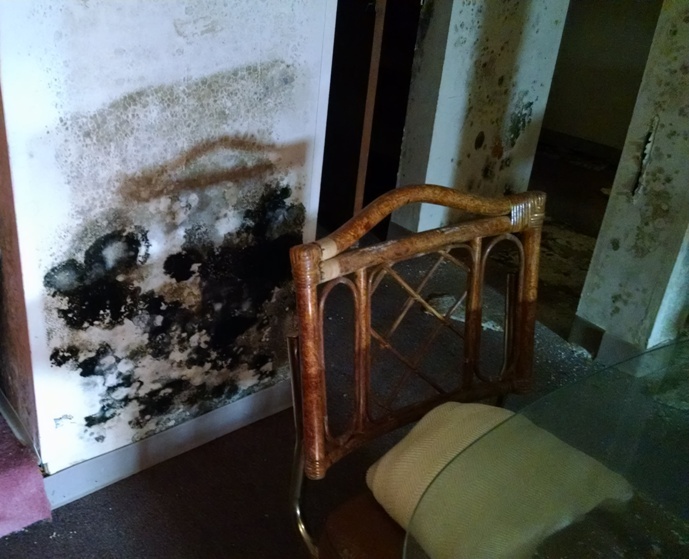 Mold can eat away at materials like wallpaper, drywall, carpet, wooden studs in walls, ceiling tiles, floorboards, and other structures inside the home. Left unchecked, mold can cause damage great enough to lead to the collapse of ceilings, caving in of floorboards, and falling down of walls. Of course, it takes a while to reach that point. Your house is not going to fall down around you as soon as mold begins to grow in it. Many materials in the home quickly become damaged beyond the point of repair, though, and in time, a home can be completely destroyed by mold growth. 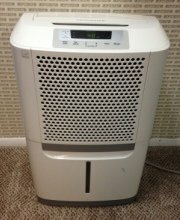 You may expect to find mold in places like bathrooms, basements and attics, but did you know mold can sometimes also be found in heating, ventilation and air conditioning (HVAC) systems? It can, and mold in your HVAC system can be particularly damaging to your home, both because it is difficult to remove mold from inside ductwork and because mold inside a home’s air ducts can quickly spread to other areas of the home. Air blowing through moldy ducts easily disperses mold throughout the entire home. For this reason, the Federal Emergency Management Agency (FEMA) recommends against turning on your heating or air conditioning if you think there might be mold in your HVAC system. Have the system inspected, and cleaned if necessary, before turning it on in order to prevent greater mold damage to your home. Note that the Environmental Protection Agency recommends having a professional clean your HVAC ducts, if you do find mold in them, to make sure the job is done correctly and safely. Repairing mold damage can be a big job. Just how big depends on the amount and degree of damage. Many materials cannot be adequately cleaned or repaired after being contaminated with mold, including things like carpet, insulation, wallpaper, mattresses and plush furniture like sofas. They must be discarded and replaced. Most of the time, moldy drywall must also be removed and replaced. Care must be taken when removing moldy materials because mold can be inadvertently spread to other areas of the home during the removal process. For instance, pulling up moldy carpet or cutting into moldy drywall to remove it sends hundreds of thousands of mold spores flying into the air. Those spores land on other surfaces and mold can begin to grow there. Wooden surfaces, including wall studs and floorboards, can sometimes be cleaned and repaired, if a mold problem is caught and addressed early. If the mold problem has progressed, though, it may be impossible to completely remove mold from wooden surfaces. Floorboards may need to be replaced. Wall studs can’t be removed, but they may need to be sanded in order to remove as much mold as possible. Any remaining mold can then be encapsulated, or sealed in, with special sealant (sanding and encapsulation should only be done by qualified mold removal professional, by the way, to make sure it is done safely). Other materials are easier to clean, such as metal, glass, tile and concrete. The process of cleaning these materials can be both time-consuming and labor-intensive, though, and safety precautions must be taken to prevent the inhalation of mold spores that can lead to serious health problems (follow this link to learn more about mold-related illness). If you’ve got a mold problem in your home and need help repairing the damage, you can schedule a free in-home consultation with a mold remediation professional. An experienced professional will visit your home, inspect the damage, make sure all areas of mold have been located, and advise you about the mold remediation process. Even if you plan to handle the repair work yourself, you can benefit from some free expert advice. To find qualified mold remediation professionals offering free consultations in your areas, just follow the link provided. Roof Mold - How clean mold from your roof and prevent it from coming back.